Under the directorship of Min Lew, Bare Opera has assumed an important position within the New York opera scene. We'd call it a case of truth in advertising when an institution fulfills its objectives. Buzz words like "alternative", "minimalist", "immersive", "intimate", and "visceral" can be tossed around as a cover for "cheap" but Bare Opera lives up to its mission so effectively that we would follow them anywhere, even to a walk-up loft, hard by the toxic Gowanus Canal. If we were not otherwise engaged we would return for the performances tonight and tomorrow night. That's how highly we esteem their production of Mozart's Magic Flute! It is a fine thing to strip an old warhorse of its cliches, as long as you preserve the spirit of the piece and the glorious music. To fill the work with superlative musical values and a sense of intimacy compensates for the lack of imposing sets and a huge chorus. As a matter of fact, it is just that ponderous group of Sarastro acolytes that has bored us in the past. By contrast, last night's production of Mozart's Die Zauberflote felt fresh and original. The only thing that was bare was the stage, furnished only with a couple of benches. The original twist that occurred at the end seemed so right and organic! But we do not want to spoil the surprise for you since you, dear reader, will feel compelled to beg, borrow, or steal a ticket by the time you finish reading! Under the baton of Maestro Teddy Poll, the 9-person chamber orchestra captured all of Wolfie's wonderful tunes with Music Director Laetitia Ruccolo as pianist. Special mention is due flutist Mira Magrill. The singers were exceptional, most of them having been on our radar for some time. The stunning soprano Larisa Martinez enchanted us as the Princess Pamina. Her voice--velvety with a steel core--perfectly portrayed the character who moves from helplessness to self-determination. She was remarkably moving in "Ach, ich fuhl's". Her Prince Tamino was performed by the promising tenor Andrew Zimmerman who has a lovely pianissimo; he created a believable modern day prince, searching for what is good, truthful, and right. A delightful twist was having Pamina secretly witnessing his viewing of her photo and deciding that she was the right one for him. He delivered a lovely "Dies Bildnis ist bezaubernd schon". We of the audience were just as enchanted by his singing as he was over the photo. As the formidable Queen of the Night, soprano Yungee Rhie fearlessly tacked both very difficult arias, letting loose a volley of vocal fireworks; she managed to bridge the inconsistencies of being a caring mother and trying to get her daughter to commit murder. Baritone Suchan Kim made a marvelously engaging Papageno with his mellow voice and humorous manner. He made a fine representation of "Everyman". We loved the moment when his intended bride Papagena (Breana Stillman) ripped off her old lady mask; he had quite a reaction. Their duet was adorable. The three ladies were exceptional--Liana Guberman, Kirsten Scott (also serving as Artistic Director of Bare Opera), and Inbar Goldmann. The scene in which they fight over the unconscious Tamino is always one of our favorites and we can't say we have ever heard it sung better or acted more humorously. What exquisite harmonies! As Monostatos, tenor Francisco Corredor turned in his typically terrific performances as he threatened poor Pamino with unwanted sexual overtures. When caught he was on his knees begging for mercy from Sarastro, sung by the sturdy bass Do Jin Jung. More beautiful harmonies were heard from the three helpful spirits--Sacha Bloch, Grace Mosley, and Alexandra Miller. Sarastro's armored men were well played by Colin Whiteman and David Charles Tay. Singing was done in practically perfect German and we didn't miss a word. Dialogue was spoken in English which was mostly understandable but presented a challenge for those whose native language is not English. Justin Griffith Brown's stage direction was effective. Seats were set up along two adjacent sides of the square room of the Gowanus Loft, giving the audience good sight lines and leaving plenty of room for the performers to interact. 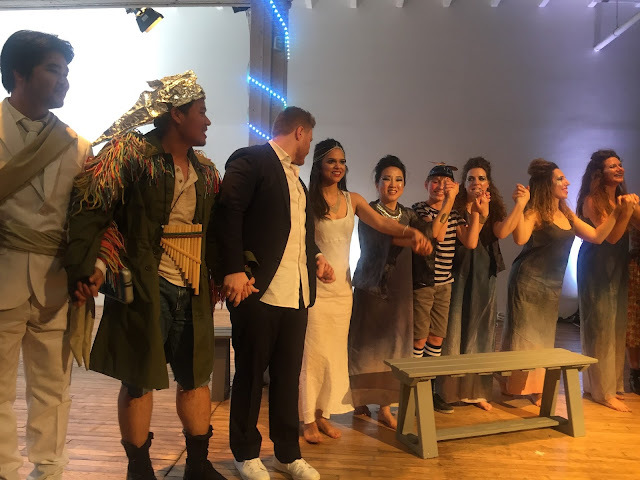 Being up close and personal made a major difference in our connection with the characters, our perception of the opera, and its philosophical underpinnings. In place of imposing sets, we had the evocative lighting of Anthony Tornambene which made use of color washes on the two walls, which did a great job of setting the mood of the scene. Isa Rodrigues' costumes were contemporary, simple, and relevant. Pamina was dressed in a long white dress which emphasized her purity. Tamino was in normal street attire. Sarastro wore all white to emphasize his spiritual orientation. Monostatos wore a raincoat, lending a reference to sexual deviancy. The Three Ladies sported otherworldly face paint. The Three Spirits wore pinwheel caps and clown makeup. The armored men wore angularly sculpted masks. Mozart wrote this "singspiel" in 1791, shortly before his death. The libretto was written by his friend Emanuel Schikaneder, apparently influenced by the philosophy of The Enlightenment and by Masonic symbolism. It became an instant success and no one seemed to mind the rampant sexism. Mr. Brown's direction included a twist that we enjoyed which put the work squarely in the 21st c. The work has always lent itself to directorial innovations, not always successfully. We suspect that if Wolfie himself had been present last night he would have joined in the thunderous approbation given by the audience. We might add that the audience was far younger than that which we customarily see at the opera. If anyone wants to know how to make opera relevant to millenials, pay attention! Clear away the cliches, say something relevant, and cast young up-and-coming singers. That Bare Opera keeps ticket prices affordable for young folks implies that support must come from those that care about opera's survival. www.bareopera.org/donate!